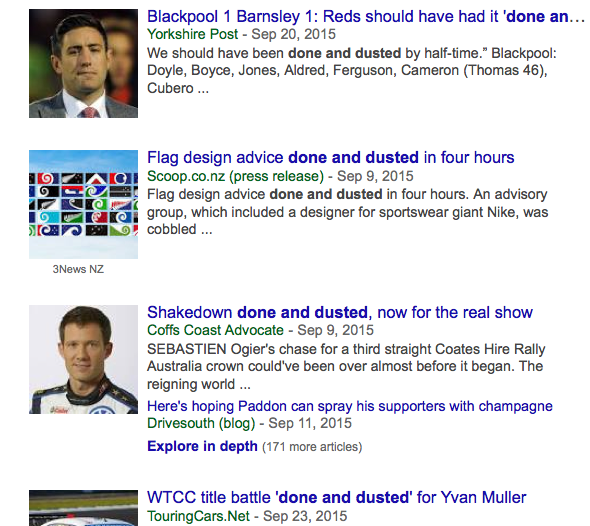 Google News results for “done and dusted” are all from UK or Commonwealth sources. I’m labeling this an “Outlier,” as it is rarely found on this side of the Atlantic. The only other times it’s appeared in the Times in recent years is in the soccer (football) columns of Rob Hughes, an English native. Using it was a nice touch on Lipman’s part, as it echoed the patois of the bloke in question. And Lipman actually replied to Freeman’s tweet, confirming that this was a favorite phrase of his. “‘And Bob’s your uncle,’ he’d add,” she added. “Bin”–meaning to throw something in the rubbish bin (meaning the garbage can)–is not only rare in the United States, it’s non-existent. I can say that because Lynne Murphy of Separated by a Common Language took the trouble to trawl the massive Corpus of Contemporary American English and find that it contains not a single instance of “bin” as a verb. Let’s hope these two can get free from the nappies long enough to come to brunch at your house or join you somewhere for coffee. There is no reason for no reason for an American writing for an American publication to use “nappies” instead of “diapers”–other than being cute, that is. There’s nothing wrong with being cute, of course, but I would be gobsmacked if “nappies” caught on here. The only “fug” I was aware of was the euphemism invented by Norman Mailer in The Naked and the Dead, later picked up by Ed Sanders in naming his ’60s rock band. But sure enough, the OED notes the word is “originally School slang” and provides this definition: “A thick, close, stuffy atmosphere, esp. that of a room overcrowded and with little or no ventilation.” The first citation was an 1888 quote from novelist E.F. Benson: “Seating himself in the most comfortable chair, as a consolation for the prevailing fug.” And there was also the interesting variation “fug-footer,” meaning indoor football and apparently spotted at Harrow in 1884. The author of the article is Rhoda Konig, who I happen to know is an American who has lived in London for years, but writers don’t write captions. The only acceptable excuse for the Times to have used “secateurs” rather than “pruning shears” is a kind of lexical ventriloquism (using the sorts of words your subject would use), but even that’s not much of an excuse. I looked up “secateurs” in the Times’ index, and it turns out that, since 1851, the paper has used it about a dozen times. All but a couple were from the pen of longtime garden writer Anne Raver, who is from Maryland.